Students at Corcoran High School protested Friday at the school. 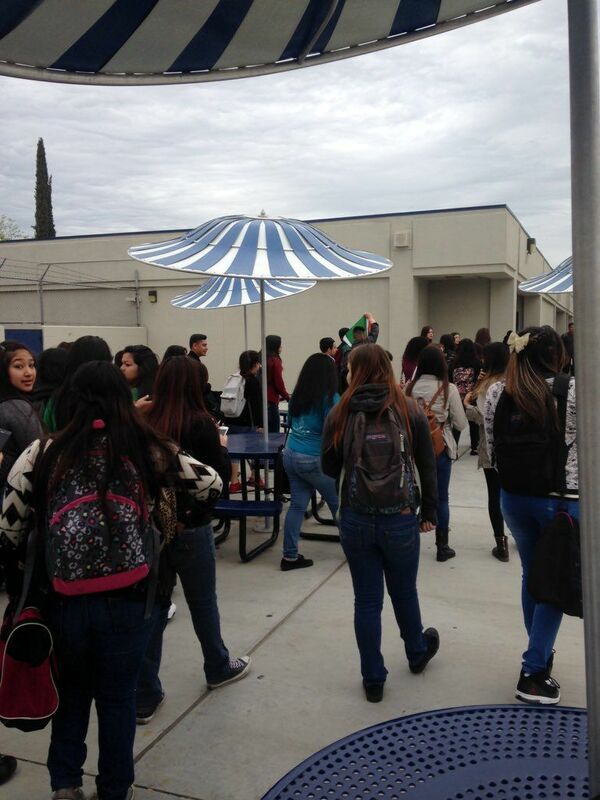 Corcoran High School students protesting on Friday. CORCORAN — Students at Corcoran High School on Friday held a campus protest against the school board’s decision to lay off a Spanish teacher. Students protested the teacher’s layoff because they think losing a Spanish teacher could take away the Spanish language, culture or heritage at the school. The Corcoran Unified School District Board of Trustees approved elimination of one of three Spanish teachers during a regular board meeting March 8. She said they used social media to gather students and ended up protesting at the quad area on campus. She said originally the students planned on protesting at the school’s rally scheduled that afternoon. She said the school found out about the protest and canceled the rally. The school principal said the rally was supposed to show recognition for the school’s tennis and swim teams. She said the school decided to cancel the rally when they heard about the protest because they did not want to take the attention away from the two teams that deserved recognition. Stone said she encourages students to speak their mind but was a little disappointed with their protest Friday. “As long as the kids are articulate and professional, I want to hear what they have to say,” Stone said. Whitfield said he was shocked to hear that he was the Spanish teacher who was going to be let go. He said he has been with the district for five years and drives from Bakersfield to Corcoran every school day. “My mind was like ‘how the heck was this happening,’ ” Whitfield said. “I’m not that teacher — that grumpy teacher — who doesn’t do innovative things,” Whitfield said. He said he is involved with students in class such as having Day of the Dead events and integrating technology into his lesson plans. Stone said letting Whitfield go was based on seniority. Stone said for the past decade the school has lost student population and has eliminated a variety of career technical education courses. Two agriculture teachers were lost because of elimination of classes. She said the school was able to pilot an American Sign Language course this semester to expand its foreign language program. The goal is to keep new Common Core standards in mind by getting students college and career ready. “In less than one hour after the [American Sign Language] course was announced, it was above capacity and we were turning a large number of students away,” Stone said. Stone said she made the decision to reduce the number of Spanish teachers to accommodate the decrease in student population and the expansion of other courses. She said the school will add more ASL classes in the future. The school will keep their two remaining Spanish teachers, leaving 12 sections of Spanish for students to take. The reduction of the Spanish department will not prevent students from enrolling in a Spanish course, Stone said. “I think a lot of the kids are misinformed,” Stone said. Whitfield said he will finish the remainder of the school year. June 3 is the last day of his contract. Why add more ASL classes when the majority of people could benefit from being bilingual. I agree that we should have an ASL class, but I think that it's ridiculous that they plan on adding more ASL classes but getting rid of a Spanish teacher. Doesn't make sense.